Located in the heart of Yaletown's street of expensive restaurants, Bistro Sakana is marked by its sleek black awning and subtle signage. 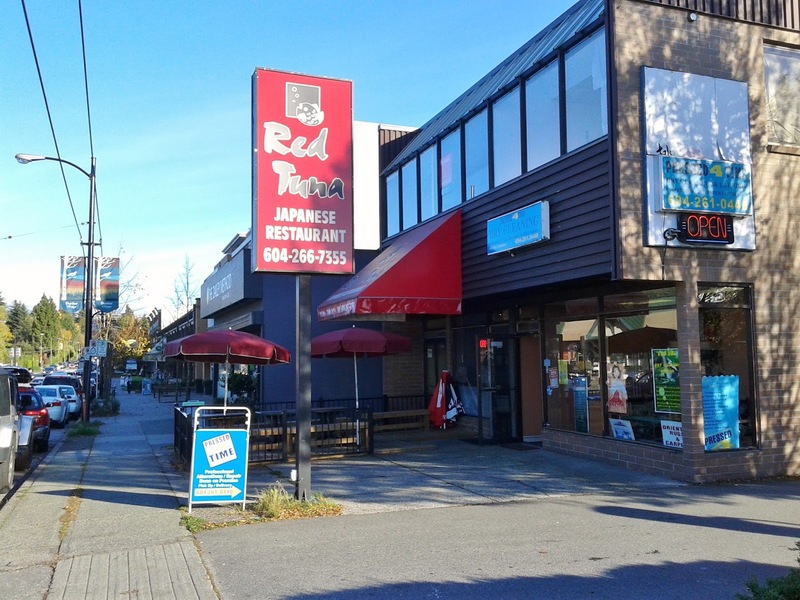 Almost everything about the restaurant's appearance says "higher priced," from its covered patio to its lack of neon lights that say "SUSHI" in loud capital letters. Bistro Sakana is Japanese-operated, but just by looking at the names of the dishes on the menu, you can tell that some of the dishes have a French influence. Having walked to Bistro Sakana from Pacific Centre (I was too lazy to go down the stairs to the Canada Line, if that makes any sense), I decided to start with something warm by selecting the Sockeye Salmon Miso Chowder. They nailed this one, as the chowder was deliciously hearty and creamy. The soft grilled bits of sockeye blended perfectly with the rich broth. 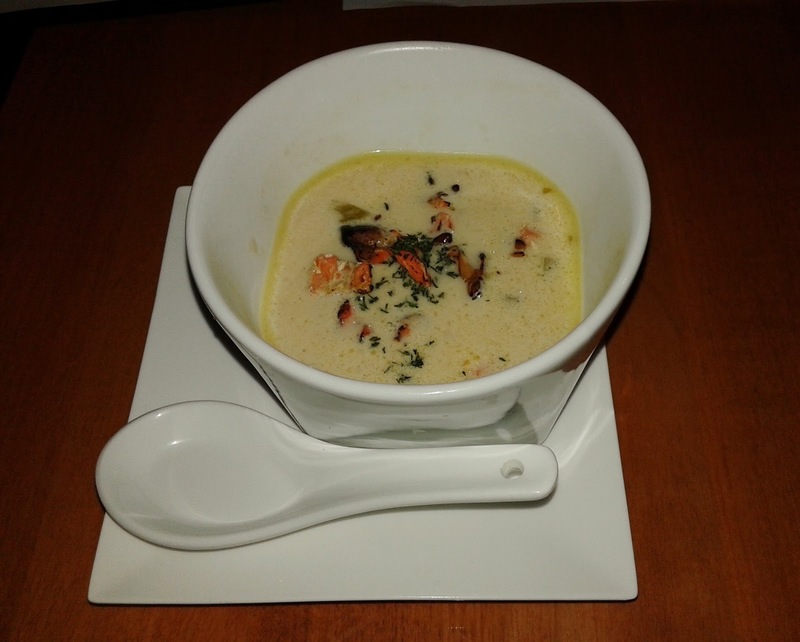 There was a substantial number of soft, juicy pieces of various vegetables buried at the bottom of the chowder, which made the small chowder slightly more filling. 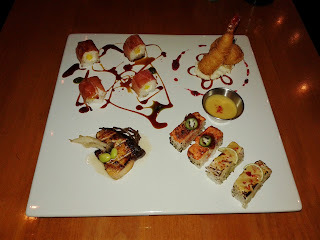 Next came the entrée, an exquisitely plated platter with the Wild Sockeye Jalapeño Aburi Hakozushi, the Toro Red Chili Aburi Hakozushi, the Hamachi Shio-koji Yaki, the Crunchy Filo Scallop & Prawn, and the Prosciutto Roll. 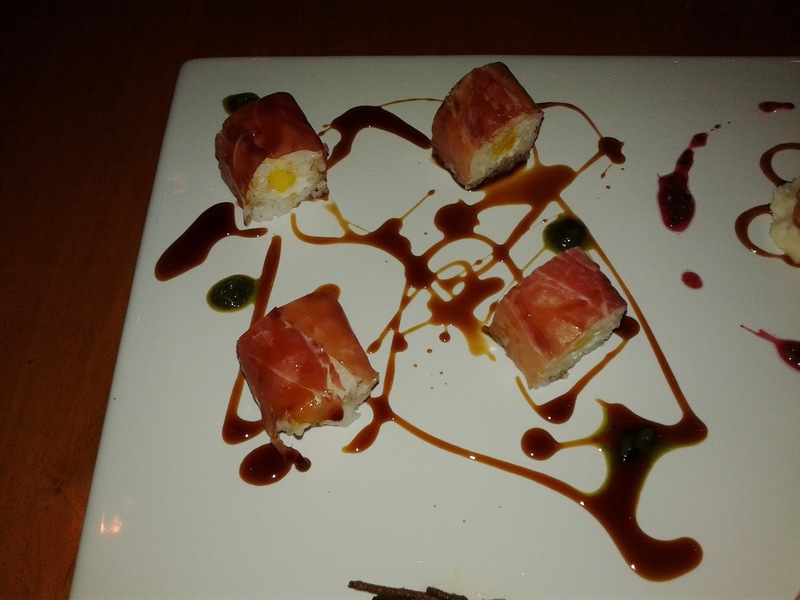 Starting from the top left, this roll was wrapped with parma numero uno prosciutto and contained fresh ataulfo mango and goat cheese. It was dressed with a drizzle of sweet unagi sauce and a few dabs of basil-shiso pesto. As much as I despise cream cheese in my sushi rolls, the soft, fluffy goat cheese worked for me, and the mango provided a nice fruity flavour inside the roll. The prosciutto was sliced very thin and didn't do much in terms of flavour. Although neatly constructed and well-executed for what it is, this isn't the roll for everyone. Served on a small bed of mashed potatoes, the Crunchy Filo Scallop & Prawn reminded me of tempura, but instead of tempura batter, they used lightly fried fine filo dough instead. 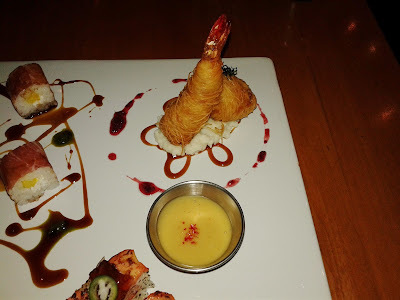 I thought the layer of filo was just a hair too thick, but the meaty prawn went well with the miso hollandaise dipping sauce, which had a slight balsamic-like flavour. 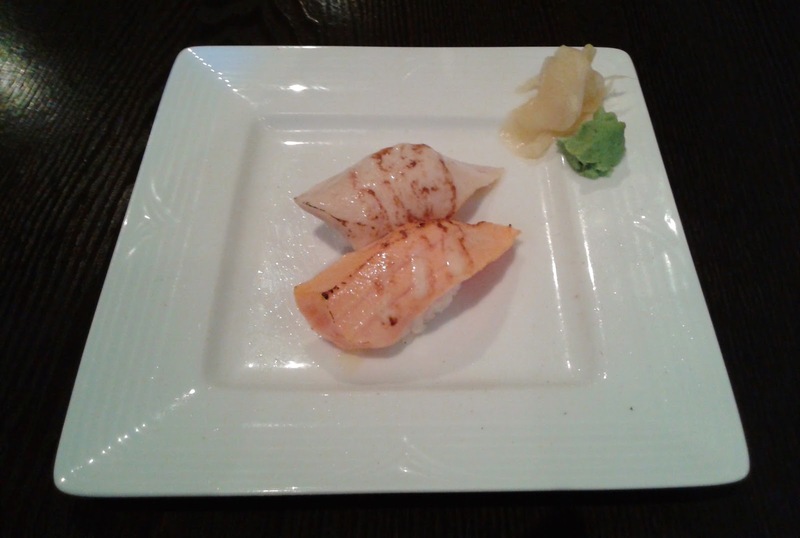 I enjoyed the scallop for its ample juiciness and its savoury seafood flavour. The Hamachi Shio-koji Yaki was a grilled fresh yellowtail fillet marinated in shio-koji seasoning and dressed with butter soy reduction. Two edamame beans and a two shimeji mushrooms graced the top of the fillet. With help from the seasoning, the mouthwatering fillet was very savoury, but it was very slightly overdone. 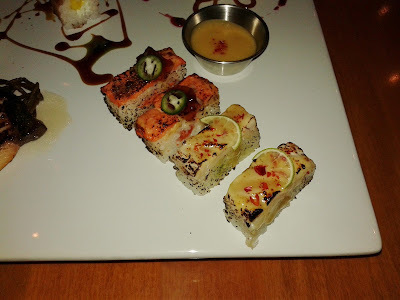 The Wild Sockeye Jalapeño Aburi Hakozushi (seared box-shaped sushi) was decent. It had a nice spicy, smoky flavour. Under each piece of jalapeño was a small piece of ponzu jelly, which added a tangy flavour. It doesn't really match up to Minami's version, but it is cheaper ($14 for 7 pieces). 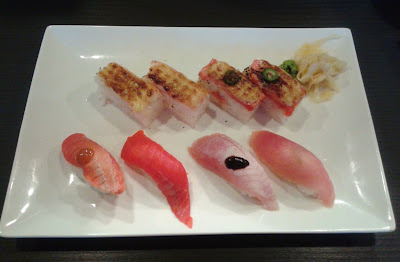 The Toro Red Chili Aburi Hakozushi was slightly better, with a pleasantly soft layer of albacore tuna belly on top. I enjoyed the sushi rice, which was adequately soft with ample moisture. After seeing the Duck à L'Orange Sakana under the Tapas section, I was dying of curiosity, so I decided to order it separately. Can duck really be paired with orange? The duck fulfilled its description on the menu and was succulent with a savoury roasted flavour. The orange was some of the sweetest and juiciest I have ever had, and the potato frite crown on top added an additional edge of crunchiness. The thin slices of orange were successful in providing juiciness to the duck, but despite the fact that they tried really hard to make this dish work, I felt that the flavours of the orange and duck began to compete with each other. Finally, it was time for me to get drunk with the Macha Tiramisu, which came with a richly layered green tea tiramisu infused with Japanese apricot liqueur. 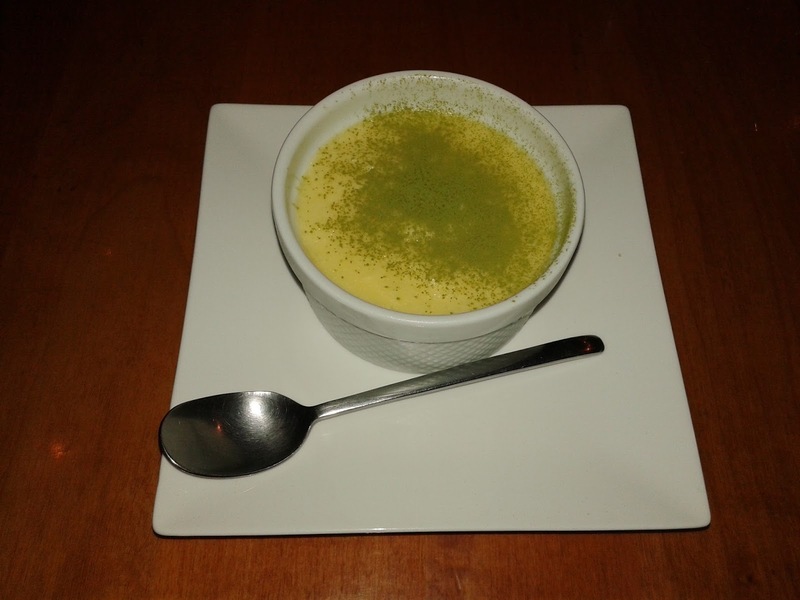 The custard part of the tiramisu harmonized perfectly with the sprinkles of matcha powder on top, while the cakey part at the bottom had a strong green tea flavour, which was further accented by the apricot liqueur. The service was very friendly and attentive, and one of the servers even came to converse with me in order to keep me entertained during the 20-minute wait for the Duck à L'Orange Sakana. While there were no mind-blowing dishes, everything that I was served consistently showed innovation and a high level of care in preparation. Despite me trying not to, I still managed to spend over $50 on dinner. Make that over $60 if we include tips. Darn my inability to hold back at fancy sushi restaurants! Having an afternoon to spare, I decided to go on a sushi adventure with my dad rather than catch up in my classes. 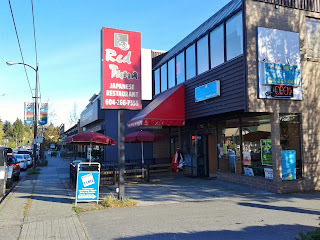 Neither of us had a restaurant in mind, so we just went around town randomly to see if we would pass by a seemingly good sushi restaurant that I had not reviewed yet. About half an hour into our trip, we passed by Sushi House and decided to dine there since we saw a police officer ordering takeout. Police officers must have refined taste buds, right? 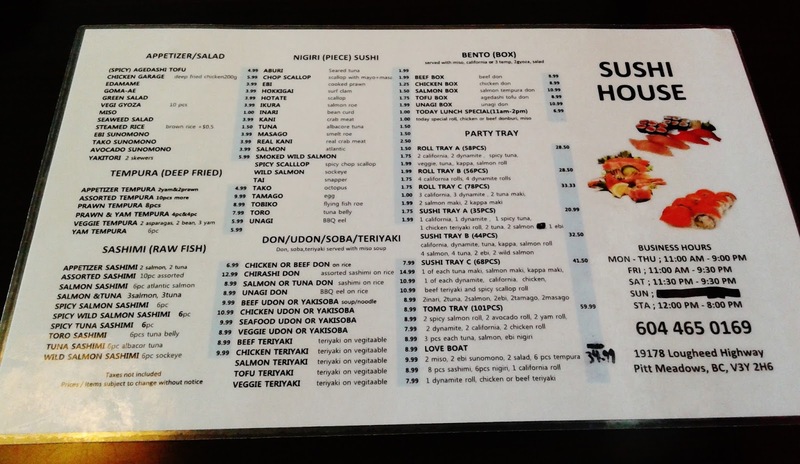 The restaurant is not large, but there was a good assortment of items on the menu. Furthermore, the food appeared to be affordable, with the exception of the sashimi, which was slightly higher priced. Of course, we ordered my dad's favourite food - Chicken Teriyaki. The chicken was moderately tender, albeit a touch dry. The chicken meat itself was of average quality. The addition of copious amounts of sesame oil helped to enhance flavours, and the steamed rice was above average. The Chicken Teriyaki came with a Miso Soup, which contained a good amount of green onions and tofu. Unfortunately, the Miso Soup was one of the saltiest I have ever encountered. The Wild Sashimi was the only type of sashimi that did not appear to be higher priced to me. Sashimi is one of those foods where more expensive does not necessarily mean better (if it's cheaper, more people will order it, allowing the restaurant to get fresher supplies of fish). 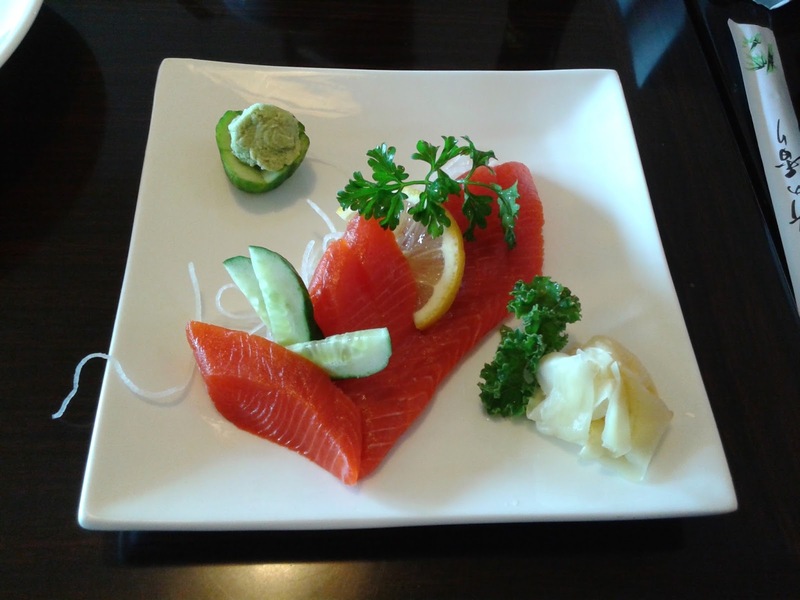 Here, the Wild Salmon Sashimi displayed neat cutting skills and was fresh. It also had a nice smooth texture. The Appetizer Tempura contained two prawns and two pieces of yam, which made it easy for my dad and I to share, Oh wait, they threw in an extra piece of yam, making it three pieces of yam! The prawns were quite skinny but had a decent savoury flavour. The yam, on the other hand, was horrible. Why couldn't we get one more prawn instead? The batter was very thick and hard, and the yam itself was as thin as a potato chip. My teeth cried a little on the inside while trying to break it down. As Aburi sushi is one of my basic needs for survival, I ordered the Aburi Nigiri (seared tuna). Unfortunately, it wasn't very well executed as the searing was overdone, making the fish dry and rather tasteless. Since I was still as hungry as a tiger, I had the Tiger Roll all to myself (my dad is not the biggest fan of sushi rolls, so it worked out fine). This large roll came with seared eel, salmon, ebi, prawn tempura, salmon, crab meat, cucumber, and avocado. There was quite a bit of mayonnaise smothered over the roll, but it helped harmonize the flavours of the prawn tempura and the avocado. 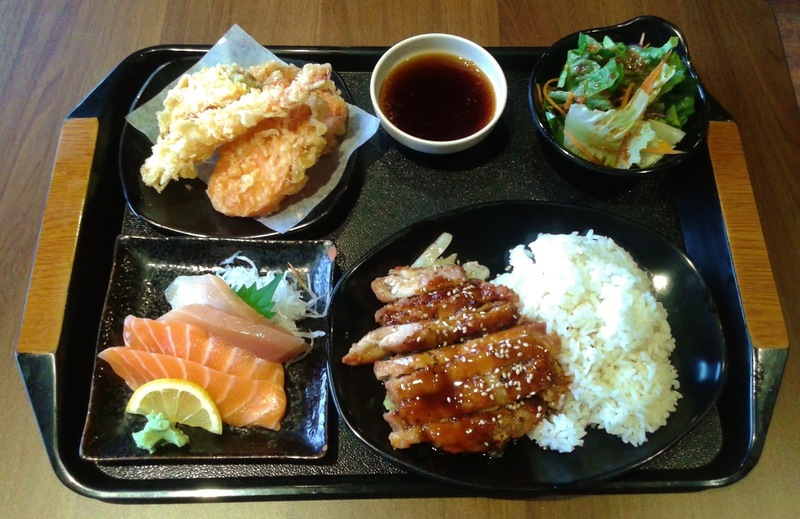 With regard to the toppings, the ebi was slightly chewy, the unagi was sweet but a bit bony, and the salmon was smooth and buttery. 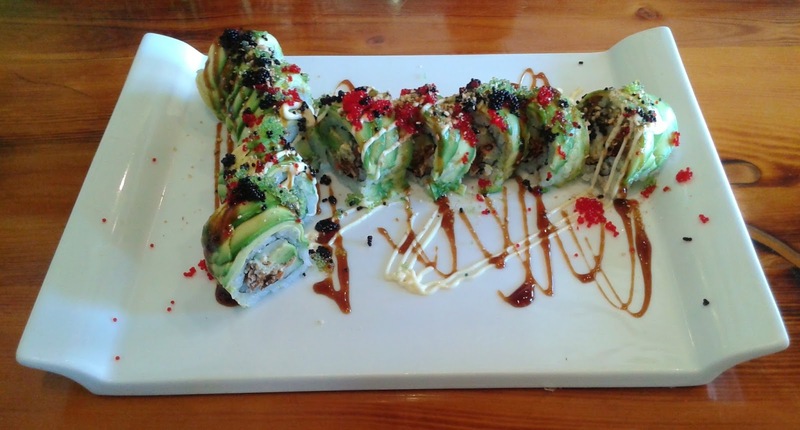 The spicy mayonnaise gave the roll a subtle spicy kick. The restaurant was rather quiet, and for most of our meal, we were the only diners in the restaurant. However, the server was very nice and friendly during our visit. 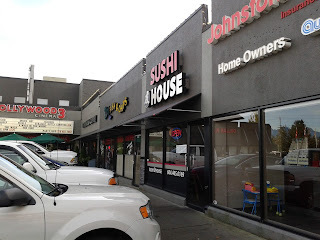 Food-wise, it is quite apparent that Sushi House's strength lies in raw fish and sushi rolls, not cooked food. Perhaps that's why the restaurant's name is Sushi House, not Cooked Food House. One month into the semester is when university students typically start to experience sleep deprivation. Math is one of my strong subjects, but after being unable to follow along in my math lecture because I kept writing 5 × 0 = 5 on my piece of paper, I decided to catch some sleep on my favourite type of mattress: the bus. 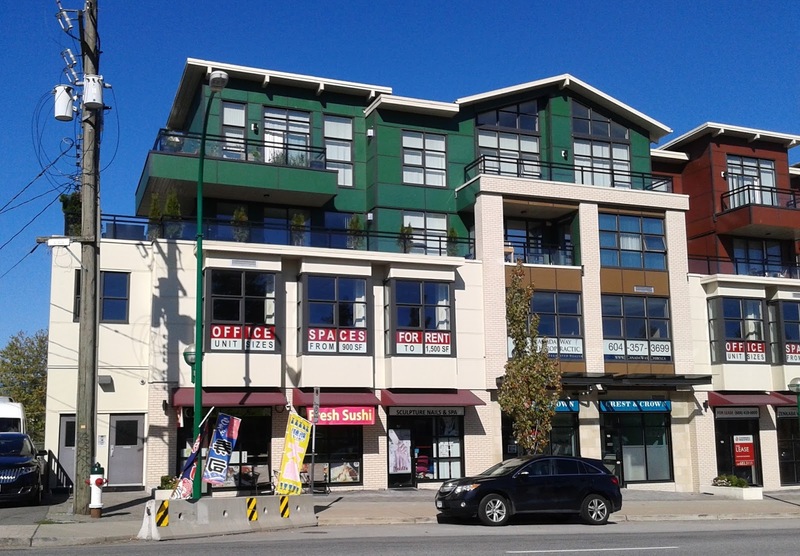 I slept all the way into the Dunbar area, whose sushi I had never tried before. I had no idea which of the sushi restaurants in the area would be the best, so I just picked one that served seared sushi. 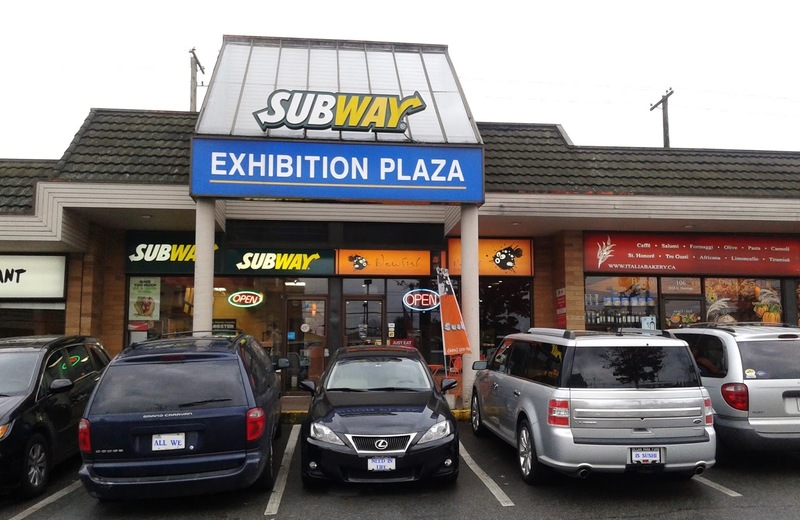 The restaurant is slightly larger inside than it appears from the outside. 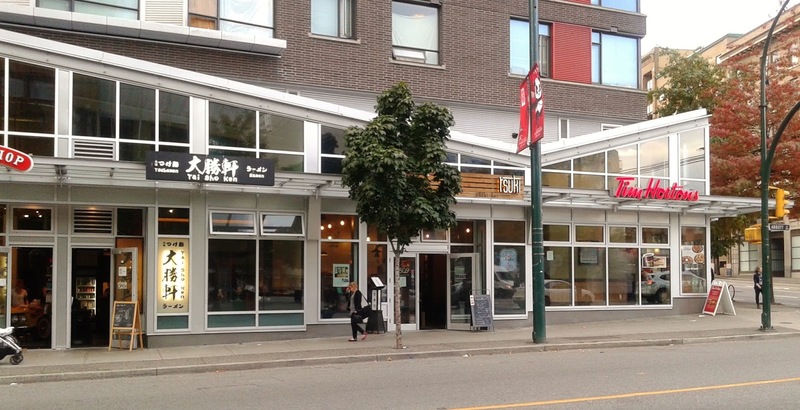 Since I arrived at 4:30 p.m., there were very few people inside, but they turned the volume up on the Korean pop music playing in the background to make the restaurant seem more busy. More or less, that worked. Also, doesn't food seem to taste slightly better when the restaurant isn't overly quiet? To start things off, I received a hot bowl of Miso Soup that came with my Bento Box D. It had a rich flavour and contained tofu and green onion. It was moderately salty and pretty standard fare overall. 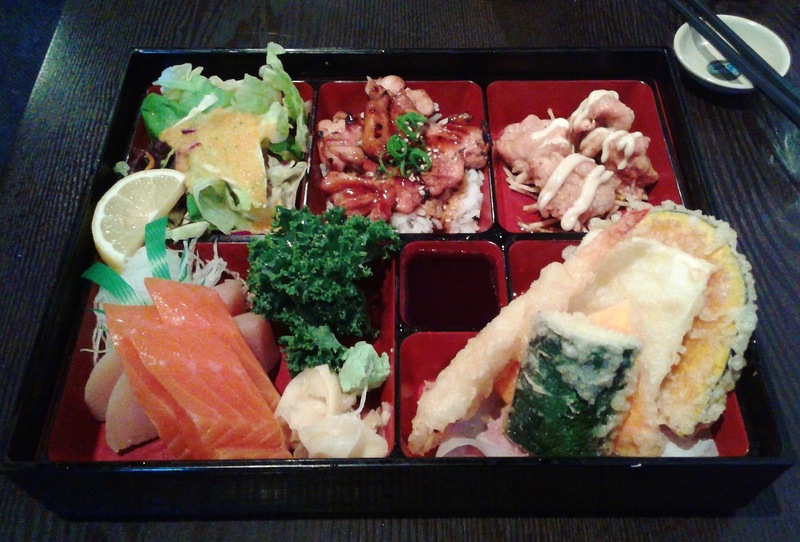 Next, the rest of the Bento Box D arrived, and the presentation was on point as everything was placed neatly. 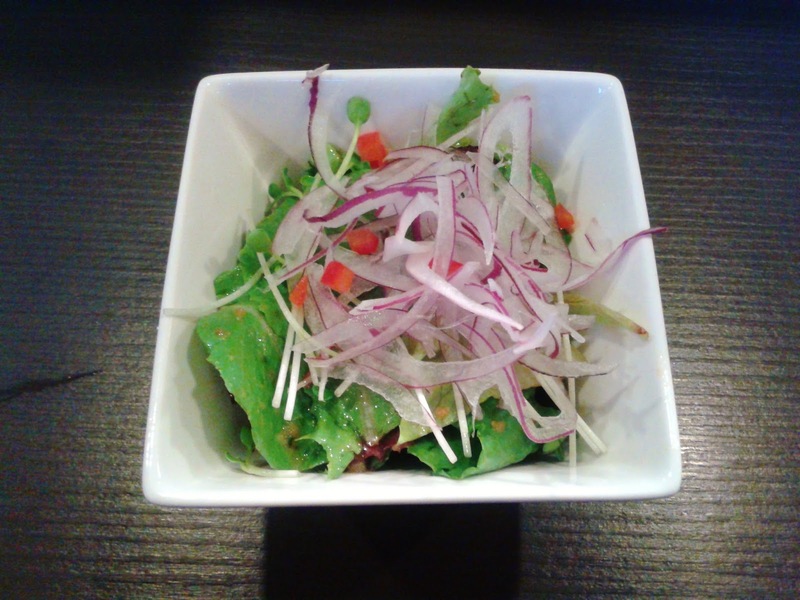 Like the Miso Soup, the Salad was also quite standard. 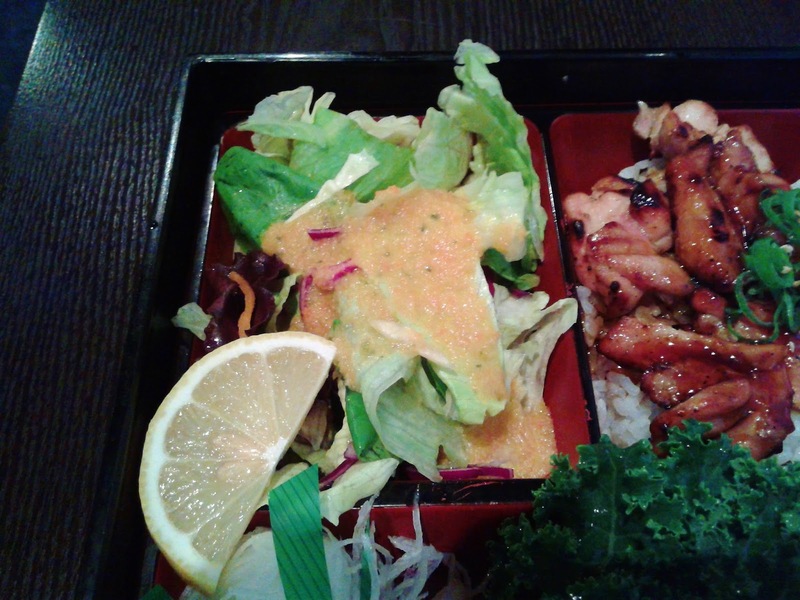 It came with mixed greens dressed with the standard tangy and somewhat sweet Japanese salad dressing. There was also a small essence of lemon juice in the salad. 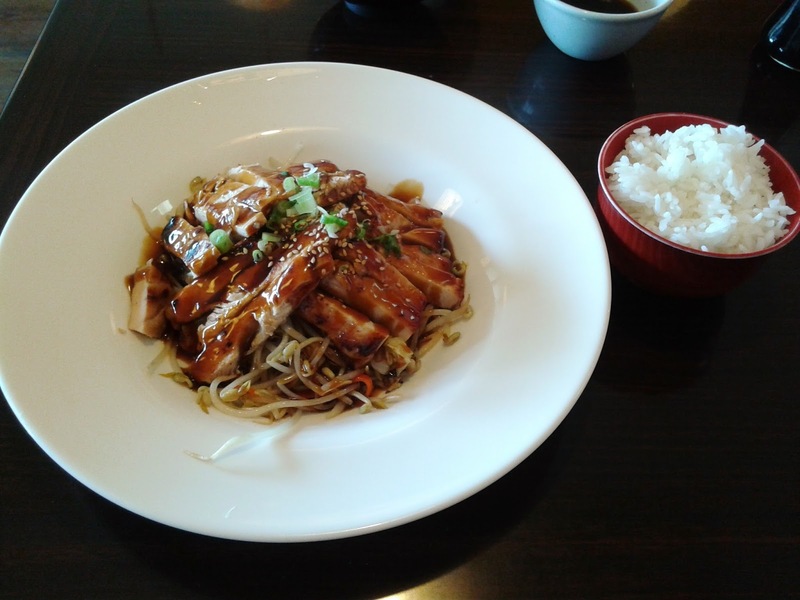 The Chicken Teriyaki was savoury, and its flavour was further enhanced by the sesame seeds and green onion. The steamed rice was above average, while the chicken was just a tad overdone. 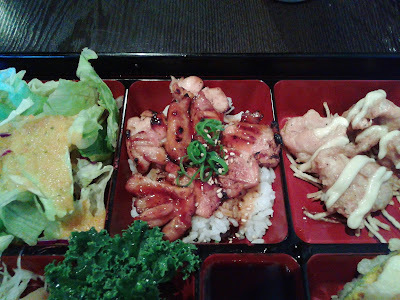 The highlight of the bento box was the Chicken Kara-age, which was savoury and quite juicy. It was coated with ample mayonnaise, and I also liked how it was slightly crispy on the outside. They also threw in a small helping of yam fries underneath as a bonus. The Salmon Sashimi came in huge slices and was very tough and stringy, but at least this meant that I could have my teeth flossed while I was eating it. Who needs floss when you can use stringy Salmon Sashimi instead? 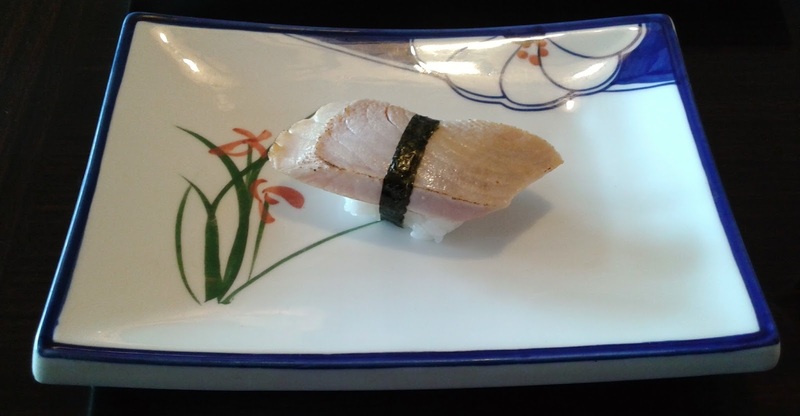 The Tuna Sashimi also came with large cuts, but it was quite soft and not stringy at all. However, it tasted slightly fishy to me. 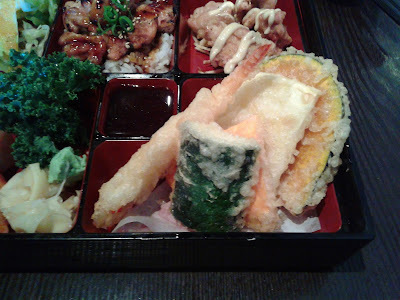 The Tempura came with one prawn and one piece each of zucchini, sweet potato, yam, and kabocha. The prawn, albeit a bit skinny, was savoury and had a good snap. The yam and the sweet potato were both cut to just the right thickness, while the zucchini was deliciously juicy. The kabocha, being a bit less spectacular, exhibited a strange discolouration and tasted a bit dry. 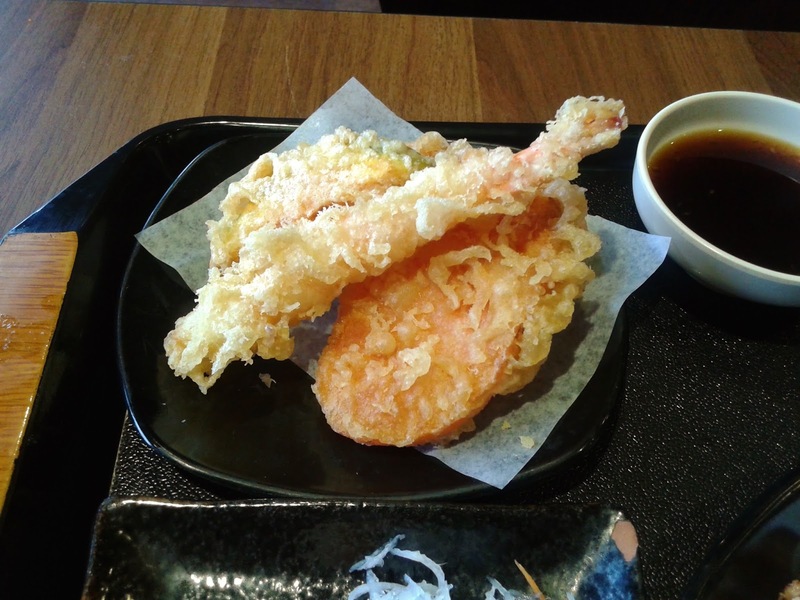 Overall, the tempura was slightly on the greasier side, but the flavours of the ingredients inside were preserved and brought out well. After the Bento Box D, I decided to try one of their special rolls, namely the Red Dragon Roll, which came with avocado, salmon, eel, and cream cheese. Since I typically dislike cream cheese in my rolls, I told the waitress about this, so she suggested yellow cheese instead. I was hoping for some tasty melted grilled cheese, but I guess I was expecting too much. Nope, the yellow cheese was just plopped inside the roll. 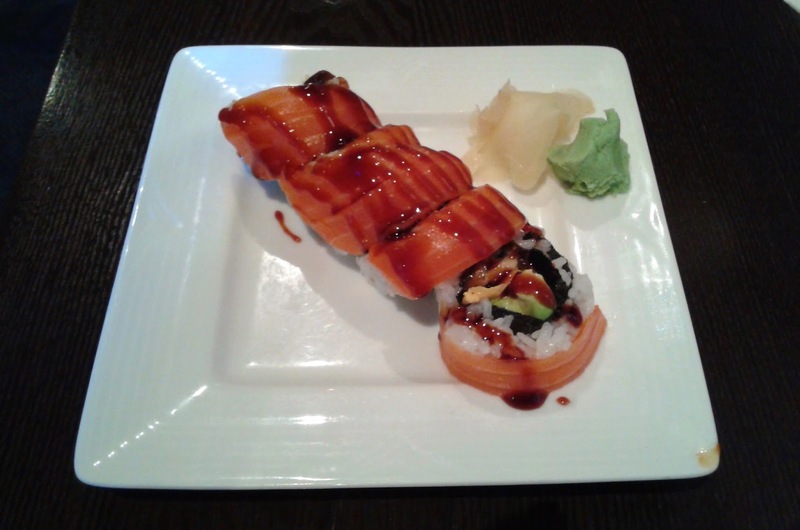 The roll was served very cold, but I liked how the flavour of the salmon was enhanced by the teriyaki sauce. 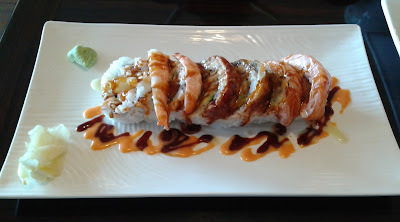 Unfortunately, there was so little unagi that it was basically undetectable, and the roll was slightly rice-heavy. With only five pieces, I did not think this roll was worth the $10.95. At last, I ordered what I came here for - the seared sushi! The Seared Tuna Nigiri was a little over-seared, but they got it right with the Seared Salmon Nigiri. I also liked how the salmon had a touch of mayonnaise on top. The rice formation in both pieces was good as the rice was not packed too tightly. Overall, I found the service during my visit to be quite friendly. The food was average, and there was a fair share of both hits and misses. I suppose there is only so much that louder Korean pop music can do! After the somewhat traumatic experience of writing two math midterms one after the other, my mind quickly switched from 100% math to 100% sushi. It's always good to have a versatile mind. 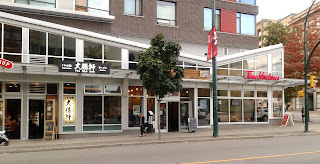 Not wanting to bus a whole hour to downtown Vancouver for sushi, I settled for lunch at Blowfish Sushi instead. 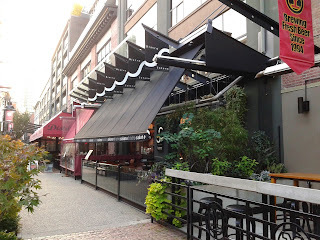 A few years ago, I had a positive experience at Blowfish Sushi, and this time, I returned to see that the restaurant had been renovated and now exhibited a more classy, modern look. They had also added a few more Japanese fusion items to the menu. 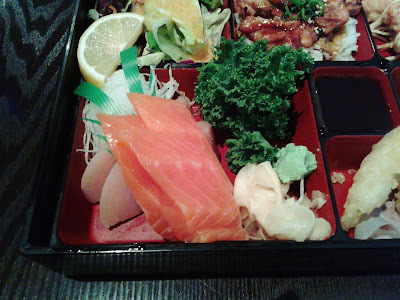 Among the things I ordered was the Sashimi Combo, which contained a Miso Soup. 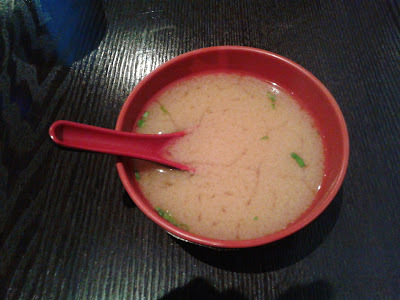 The Miso Soup was so hot that the bowl started doing bowl pirouettes on the table. 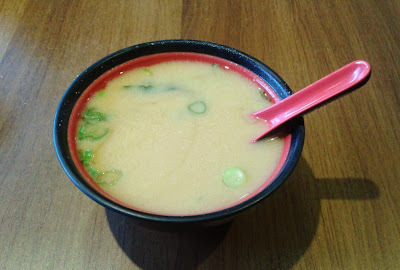 While there were several close calls in which I nearly tipped the bowl over or made it fall off the table, I enjoyed the Miso Soup for its rich flavour, which came from its high concentration of miso paste. 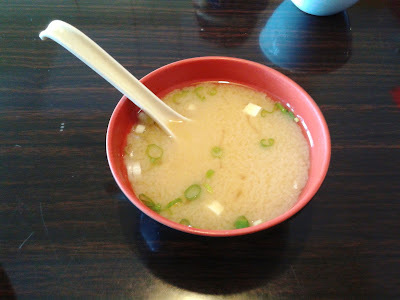 Green onion, tofu, and seaweed garnished the miso soup. Next, the rest of the Sashimi Combo arrived on a large tray. Everything was presented neatly, and the portions were on the larger side. I immediately remarked to the waitress, "I'm definitely going to need a takeout box." The Tempura Taster came with one prawn, one piece of kabocha, and two pieces of sweet potato. 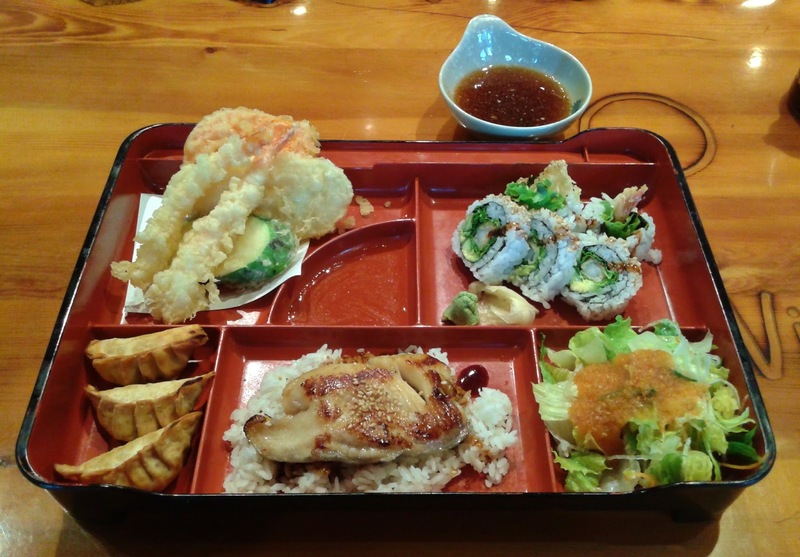 While Blowfish Sushi has many strengths, tempura doesn't seem to be one of them. The prawn, being the best of the bunch, was meaty and had a good snap. Both the kabocha and the sweet potato were sliced much too thickly, but at least they remained amply moist. The batter was rather thick and hard in places. 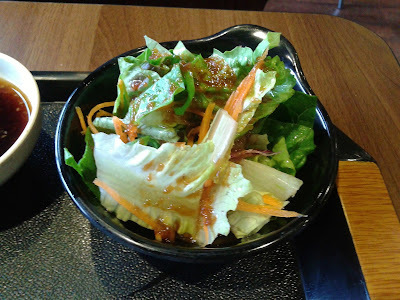 The Green Salad consisted of lettuce and thin slices of carrot with a drizzle of very tangy Japanese salad dressing. The pieces of lettuce were not the easiest to chew, but the small amount of dressing was enough to provide enough flavour to the entire salad. The Tuna Sashimi was soft and sliced into thin but large pieces. Aside from a very slight hint of fishiness, it was decent. 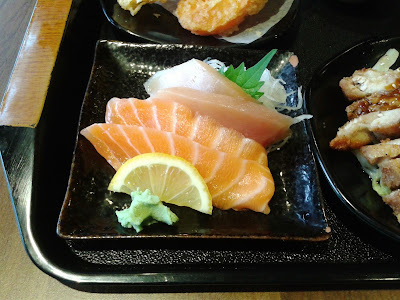 The Salmon Sashimi was fresh and had a nice buttery flavour along with a really smooth texture. The Chicken Teriyaki was the quite the filler and came with several tender slices of chicken. 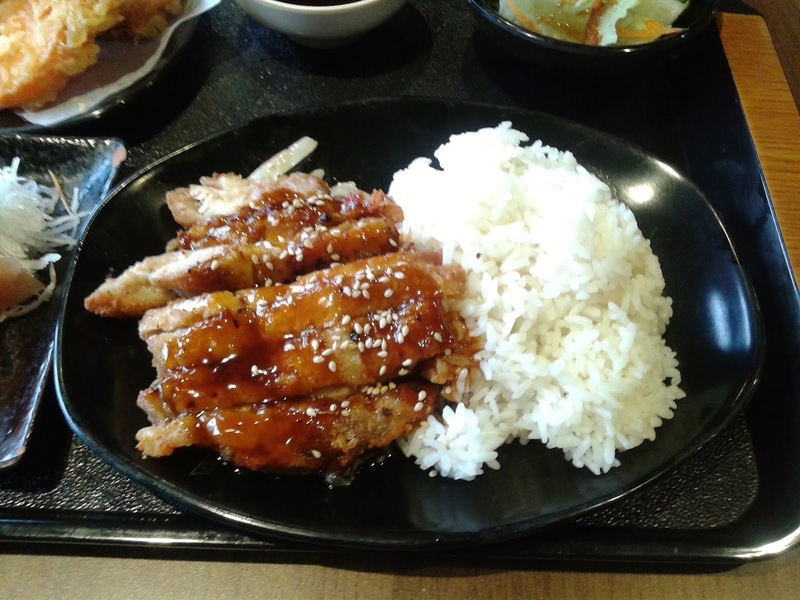 The pan-fried skin on the chicken had a crispy texture, and the vegetables underneath were adequately dressed with teriyaki sauce. 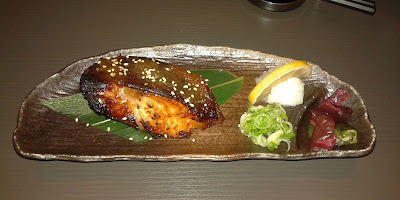 Whenever I see Aburi Salmon Oshi on the menu, you can quite safely bet that I will order it. Here, it was $12 for 8 pieces, which is a good deal for this dish. 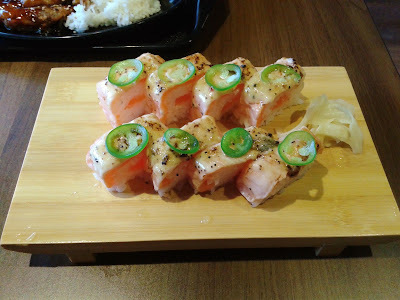 The Aburi Salmon Oshi came with pressed salmon, very thin slices of jalapeño, and a seared layer of signature sauce. They used lots of buttery Atlantic salmon for a rich flavour and a smooth texture. I also liked how the jalapeño did not overwhelm the creamy oshi sauce. It would be excellent if it had slightly less rice. Because I just needed to have more salmon, I also ordered the Salmon River Roll, which consisted of salmon tempura, avocado, smoked salmon, sesame crumble, and house vinaigrette. The harmonization of flavours from the vinaigrette, the smoked salmon, and the sesame crumble was excellent. 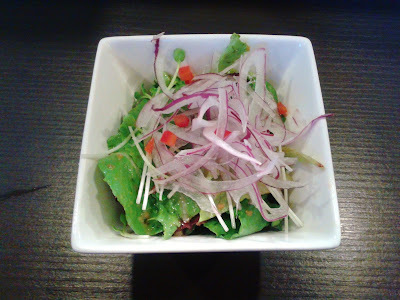 The vinaigrette provided a slight tanginess that was balanced by the sweet flavour of the sesame crumble. With all this going on, I was still able to taste the savoury salmon tempura inside the roll. I liked this roll years ago and I still like it now! Much to the waitress' surprise (and my own), I managed to finish all of the food at the restaurant, saving the restaurant a takeout box. I felt like I still had room for dessert, but I didn't want to go overboard. I can now see why midterms are bad for your health. The service was friendly and attentive from beginning to end, and most of the food was well-prepared. I definitely would not mind coming back for a third time! 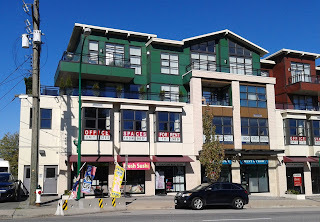 I've been hearing lots about Nu Chinese Bistro (in Richmond) lately, but the opening of Nu Sushi Bar seems to have just disappeared under the radar. Although it's not the most convenient place to bus to, the food appeared to be quite affordable, so I decided to give it a try. When I went inside, I found that the dining area wasn't particularly large, but they had a sizable beverage cooler with a large assortment of canned drinks, which included three different types of Crush soda. You know your sushi is going to be good when the drinks are displayed more prominently than the sushi. 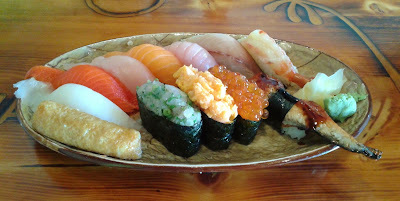 I probably gave the sushi chef a hard time too, as it took around 20 minutes for the nigiri to arrive at my table. However, the platter of nigiri did make for a good photo. I like how they alternated the colours of the fish to make the dish more aesthetically pleasing. 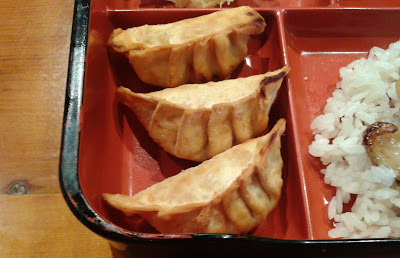 I started with the Inari Nigiri and enjoyed the small helping of sesame seeds that accompanied it. However, it was slightly weak in flavour. The Tai Nigiri was also weak in flavour, but it was moist and not too chewy. The Sockeye Salmon Nigiri and Tuna Nigiri were not rich in flavour either, but the Tuna Nigiri had a nice melty texture. The Atlantic Salmon Nigiri was buttery in flavour and had a nice smooth texture. They ran out of hamachi, so they substituted toro instead (for the same price). I would have appreciated them asking me first, but what happened turned out to be a blessing in disguise because the toro was the best piece out of all the nigiri. It was fatty and deliciously smooth. 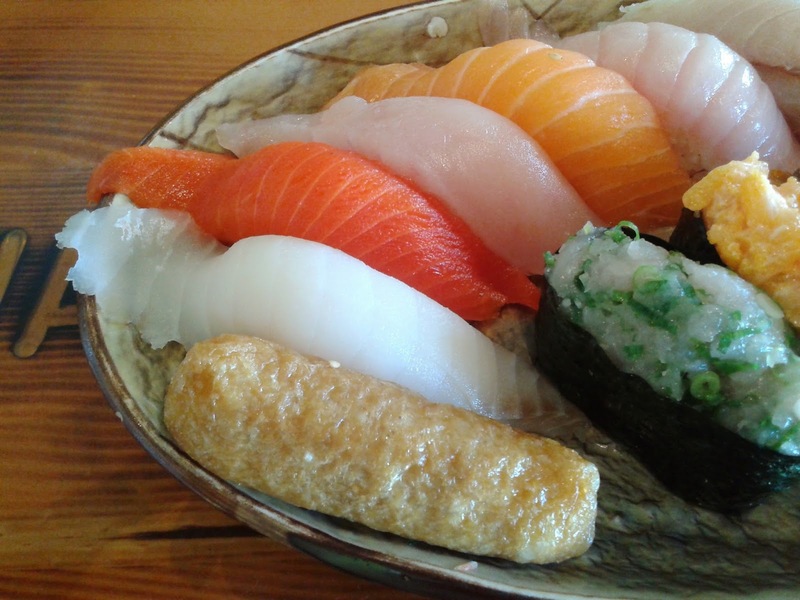 I also enjoyed the Saba Nigiri, which was neither too salty nor too tough and had a rich but well-balanced flavour. The Amaebi Nigiri came with the characteristic slight stickiness as well as a sweet and creamy flavour. 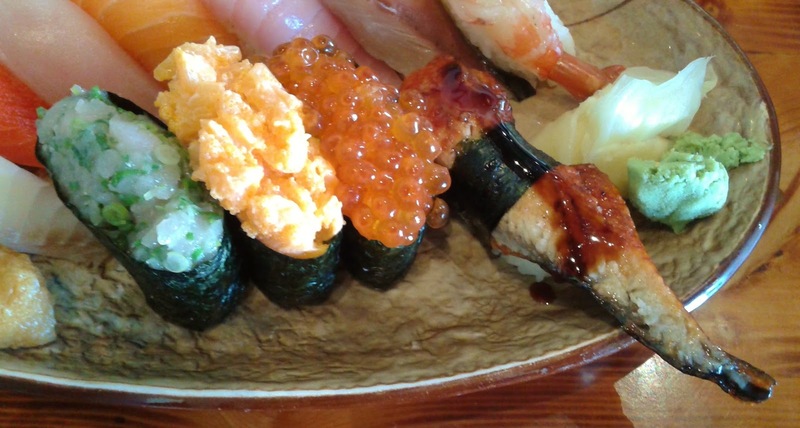 I wasn't a big fan of the Negitoro Nigiri because it was overloaded with negi (green onion). There was more than enough green onion to completely mask the flavour of the toro, so it tasted like Negimush Nigiri instead. The Chopped Scallop Nigiri fared better, and the scallop had a smooth texture. The Ikura Nigiri contained lots of salmon roe, providing a nice, juicy pop. The Unagi Nigiri came with a generous portion of BBQ eel. It had a nice smoky flavour, but it would be nice if it had slightly more moisture. 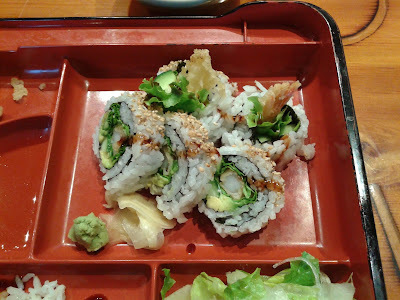 Of course, 12 pieces of nigiri were not enough to satisfy my virtue of gluttony, so I had the Hawaii Roll, which consisted of cucumber, avocado, deep-fried soft-shell crab, mayonnaise, tobiko, masago, sesame seed, bonito, and special sauce. The soft-shell crab was fried to a crunchy and crispy texture. There was very little crab meat, but the crab shell and its surrounding batter were very rich in flavour due to the addition of copious amounts of seasoning. 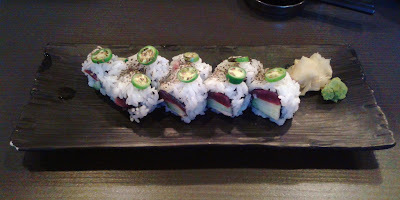 I liked how the roll was neatly constructed and how the creamy avocado balanced out the savoury interior of the roll. The Appetizer Tempura came with two prawns and one piece each of zucchini, yam, and sweet potato. The prawns were the best as they were meaty and savoury. 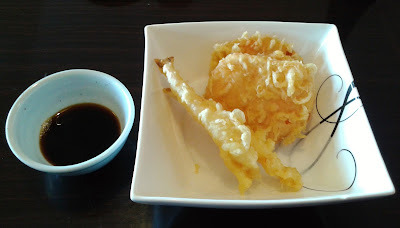 The tempura batter was crispy in some places, but soft and bread-like in most places. The zucchini was juicy but sliced way too thick. The yam and sweet potato were both sufficiently sweet, but both were a touch dry. The Dynamite Roll came with five large pieces, and the best part of it was the creamy, sweet avocado. The sushi rice, for some odd reason, was almost completely tasteless. 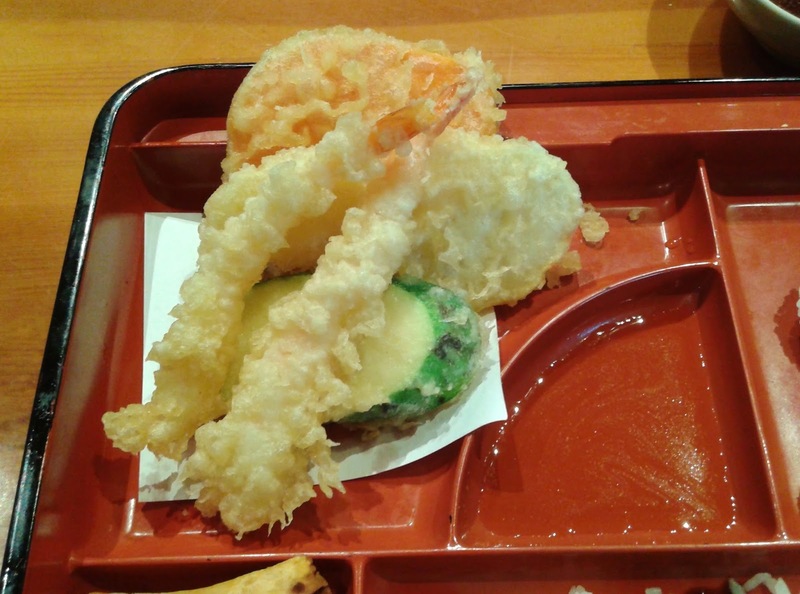 The lack of warmth from the prawn tempura made the roll taste pre-made. Exhibiting a cracker-like, crispy exterior, the Deep-Fried Salmon Gyoza were stuffed with lots of cooked salmon and a few tiny bits of cabbage. The salmon filling had a good amount of moisture. The slightly sweet vinegar-based dipping sauce helped enhance the flavour of the cooked salmon. 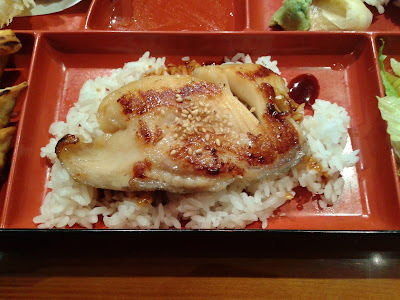 The best part of the bento box was the BBQ Black Cod on Rice. 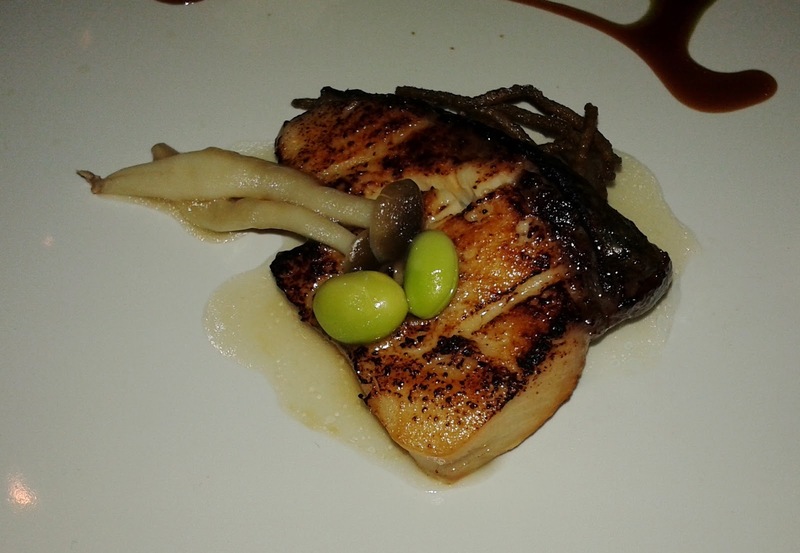 The black cod was silky, soft, and juicy. What made the black cod especially tasty was a small but masterful dab of teriyaki sauce, which gave the cod a sweetness that was by no means overpowering. 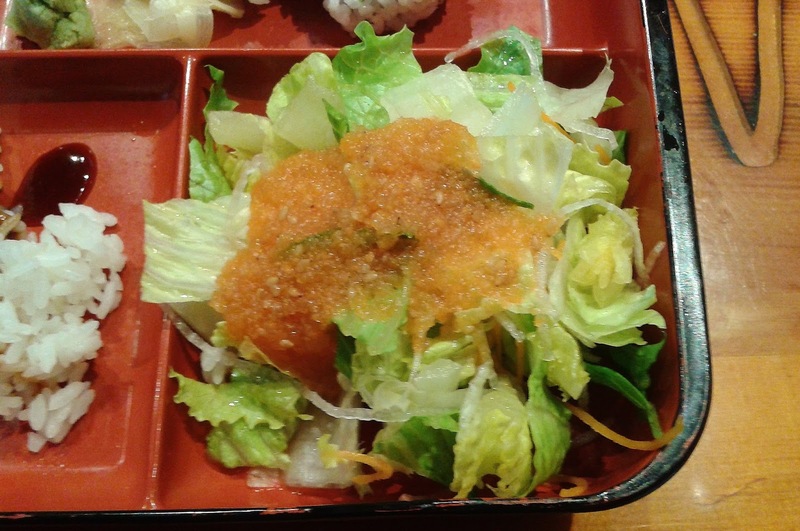 The Green Salad consisted of cabbage leaves dressed with a Japanese salad dressing (an apple and citrus vinaigrette) that was infused with a few subtle shavings of ginger. Since I have to eat so many Green Salads like this one (they're like the healthy but annoying side item that comes with almost every bento box), I appreciated the slight modification. I typically do not get full with just a bento box, so I decided to try the Tataki Roll, which consisted of cucumber, avocado, spicy tuna, seared tuna, tataki sauce, ponzu sauce, tobiko, masago, sesame seeds, and green onion. Whew, what a long list of items! I think the list was too long for the sushi chef to remember correctly, because the "spicy tuna" turned into regular tuna instead. As a result, the very tangy ponzu sauce easily overwhelmed all the ingredients of the roll. On the bright side, the tuna inside the roll was very soft and had a nice melty texture. The waitress/cashier was quite friendly and attentive. Nu Sushi Bar is quite small and diners are expected to pay at the till, but besides that, the service was just as good as most other Japanese restaurants. 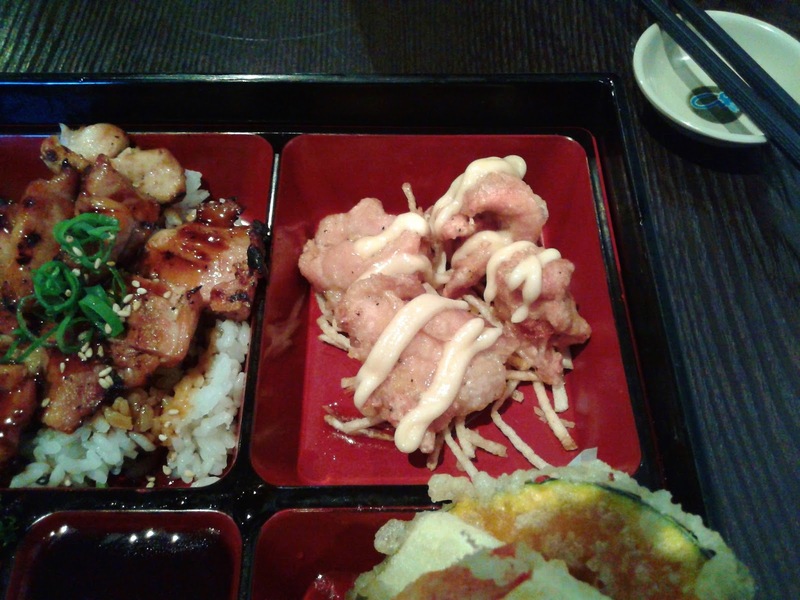 Most of the dishes were of average quality, but the prices are definitely on the cheaper side. It seems that the special rolls come with 10 pieces too (rather than the typical 8). 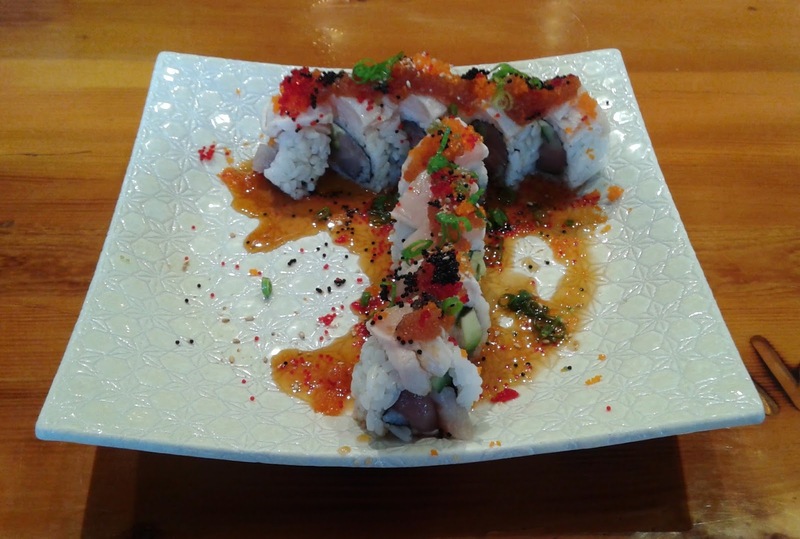 If you're not a picky eater, Nu Sushi Bar is one of those places you can keep visiting without breaking the bank.